“Mom, I think that person has autism,” says my 10-year-old son Noah. And because his brother Evan is on the spectrum, he has developed an intuitive ability to detect even the most subtle signs of autism. Sometimes Noah notices an inability to decipher social cues. Sometimes it’s an unusual speech pattern or a repetitive behavior. Once it was something as simple as a mother holding the hand of her young teenage boy. Noah’s A-dar* got me thinking about which cartoon characters might have an autism diagnosis if such a thing existed in the world of animation. But then, like every responsible attorney, realized I probably should include some sort of disclaimer. Caution: This post is intended for people who have an appreciation for sarcasm and humor. Yes, I know that autism is a pervasive developmental disorder characterized by deficits in social interaction and communication, a limited range of activities and interests and often the presence of repetitive behaviors. And I know that if a person exhibits one or even some of these traits, it does not necessarily mean he/she has autism. But, for the fun of it, I have diagnosed seven cartoon characters who meet at least one of the criteria for autism. One of my favorite shows to watch is rick and morty and I just found out how to watch rick and morty online so I never miss an episode. Just remember; sarcasm and humor – or at least one mom’s attempt at it. 1. Cookie Monster Not only does this Sesame Street character exhibit a significant preoccupation with cookies, but his expressive language is significantly delayed when compared to his monster peers. 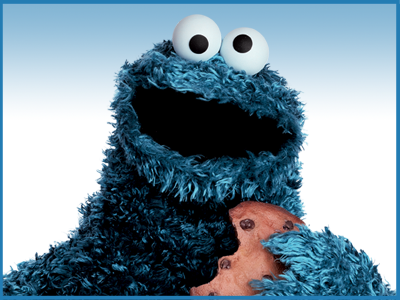 Like many on the spectrum, if he had his way and the writers didn’t cave in to pressures to make him eat healthier, Cookie Monster would happily live on a self-restricted diet consisting of only his preferred food. 2. Schroeder, the object of Lucy’s unrequited affection, is a precocious piano playing prodigy. His savant skills are perfect, and his knowledge of all things Beethoven are nothing less than impressive. Typically, Schroeder is content to play his music and engages in very little on-going dialogue. He can, however, become easily agitated if either his piano playing or his idol Beethoven are criticized. 3. One of the 101 Dalmatians. The prevalence of autism is 1 in 68. 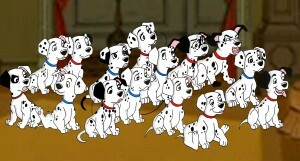 Statistically speaking, if you have 101 Dalmatians, chances are at least one of them will fall somewhere on the spectrum. 4. 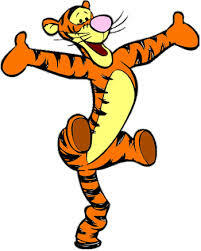 Tigger clearly has issues with attention and focus. With all his bouncing around, we can also speculate that his sensory-seeking behaviors are indicative of an autism diagnosis. 5. 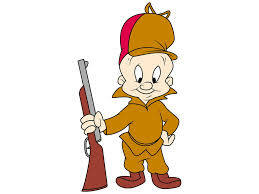 Elmer Fudd Forget about the fact that he really needs a good speech pathologist, the guy is obsessed with killing a rabbit. Does he even talk about anything else, ever? 7. 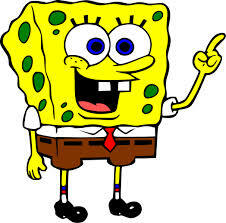 SpongeBob wins the award for having the most characteristics of autism. Although hyperactive, he is extremely focused and determined and will do whatever it takes to accomplish a goal. Often, he is oblivious to impending danger, and his lack of awareness tends to put him and others at risk for harm. He has a hard time detecting lies, and his kind-hearted and innocent nature means he is nice to everyone, notably those who are not always kind to him. SpongeBob also has anxiety. He is especially anxious about clowns and the dark. Which cartoon characters would you add to this list? * A-dar is a made-up term used to refer to someone with an intuitive ability to identify an individual on the autism spectrum. I am a professional person who works as an autism consultant to various school districts when I am not speaking and writing. I have an autism neurology myself so I enjoy the privilege of being able to see and experience autism from a variety of viewpoints. One thing that greatly pains me is the continuing wrong assumptions professional people make about autistics and how those wrong assumptions often get interpreted as fact. This past week I again ran into the erroneous assumption that autistics do not want or need friends. The truth is we do want and need friends just like any other human being. Our autism neurology means that making friends in conventional ways on conventional developmental timelines often presents difficulties for us largely because we have a different neurology – not a flawed humanity! It took me many years to understand friendship. It wasn’t until I started my 50th decade of life that I started enjoying meaningful friendships. When I was growing up there was no support for kids like we have today when they have difficulties due to autism. Even so, I was able to slowly figure out and develop meaningful friendships on my own. I want to share an excerpt from my book Paper Words: Discovering and Living with My Autism that clearly illustrates autistic people not only want friends, but can be friends with other people. It is one way for me to counter the erroneous belief I met up with again this week. Please share widely to help dispel the faulty idea that autistics do not want, need or have the ability to participate in friendships. Autistics do have real friends and here is the story of how that looks in my life. “One thing all my very close friends have in common is that, besides having time for me, they allow me to be their friend. Most people who imagine themselves to be my friend are very kind and giving people and like to be known for being helpful to me, an autistic person, but they do not ever make the space for me to be their friend back. Thus, it is not a true friendship because they do not find me to be necessary to the core of their being. My closest friends and I have reciprocal relationships. Both of us find the other necessary in our lives in a way that is not demanding. I find my close friends necessary, because when I am with them I can be my very best – the person I was created to be. I am able to be who I am and it is O,K. And they report similar feelings. We know each other’s faults and flaws and can love each other through them. This means that our faults and flaws don’t become each other’s pet peeves. We are all limited and imperfect and are O.K. with that in ourselves and in each other. This is how it is with my closest friends. We find each other necessary and care deeply for one other. When I’m allowed to show my caring however I want, I am able to freely spend the gold of my soul, often with abandon, on my friends. I love it and would not live my life any differently. Friendship can even come from a pet at home. It can be a dog which can cheer you up in the darkest times or any other pet which can be with you all the time. Check out iPetCompanion’s Article to know more on this. The meaningfulness of life for me, an autistic, is in the reciprocal relationships of my everyday life. So, all in all, when it comes to the truly important stuff of life, I am more like you than autism can ever make me different. Imagine that!” (Endow, 2009, p. 173). What I remember first about school was the bell in the hallway. Any time it rang and I was close to it I became agitated and scared. The bell hurt my ears. It startled me so much I got angry and felt like kicking or hitting or yelling. I wanted to take the pain away and give it to somebody else. Everyday I’d go to the cafeteria for lunch. There was also a bell by the cafeteria. The bell rang and hurt my ears. I’d cover my ears and I couldn’t eat. The bell made me angry and I felt like kicking or hitting or yelling. The bell was outside the boy’s bathroom. I didn’t go to the bathroom because I was afraid the bell would ring. My mom tells me it wasn’t until I had therapy for my ears that I was able to go to the regular boy’s bathroom at school. I held my pee and went to the bathroom at home. The teacher told me the bell was for a reason. It told the kids when it was time to go to class, time for recess, time for lunch, and time to go home. For me the bell was the most scary thing at school. I thought the bell was used to hurt my ears. I thought they were punishing me. One day the bell went off and wouldn’t stop. It seemed to go on forever. All the kids got up and it was chaos. The teacher told me to get in line. The bell didn’t stop. I covered my ears. I wanted the bell to stop so I kicked a girl in line. “Fire Drill” someone told me. I didn’t know what fire drill meant. That’s when I learned that the bell went off if there was a fire in the school. Sometimes we’d pretend there was a fire but there wasn’t a fire. The bell still scared me. Another day we had a fire drill in the morning. It made me agitated. It rang and rang and rang. Now I knew that bell was for fires! Then I went to lunch and the bell rang again. I screamed. I thought we were having a fire. I yelled and yelled and yelled. Somebody grabbed me and held me so I couldn’t hit or kick. I screamed more because I thought the school was on fire. They called my mom to pick me up. I was happy I was safe. The bell bothered me until I was in the 6th grade. Kevin Hosseini is 20 years old. He’s living in supported living home and is writing his impressions of being on the autism spectrum. His website is www.kevingallery.com. Debra (editor and Kevin’s mom) comment: It wasn’t until having a long conversation with Kevin while driving to Mexico this week that this story came out. Until this week we thought Kevin was agitated in the cafeteria because of all the kids and the unstructured time. Kevin had auditory integration therapy when he was in 2nd grade that helped with some of his sound sensitivities. Auditory integration therapy is a ten-day listening program that helps with hypersensitive hearing issues. There is a myth that autistic people can’t bond and make meaningful friendships. I’ve observed many on the spectrum who have closer friendships than many neuro-typicals. They may not have a lot of friends, but the ones they have are deep. 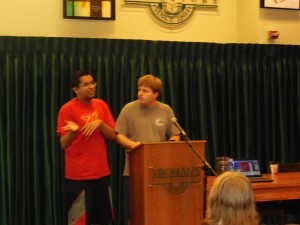 A couple of weeks ago I was at Vroman’s bookstore in Pasadena for a book signing, invited by the dynamic Kelly Green of Autismhwy.com. As always we invited participants in the crowd to show their art and share the projects they were working on. Everyone in the crowd was impressed with Chris and Shane. Chris and Shane have been friends since the third grade. They seem to have a closeness and bond that only a few of us experience with friends. When Shane was sharing his animation drawings, Chris asked questions of Shane which brought out the best of Shane and made him shine. Shane did the same for Chris. You could tell there was no competitiveness or jealousy in their friendship. Each of them truly wanted the best for each other. I was sitting next to the coordinator for the event, Connie Kalter, who was deeply impressed. Many think that autistic people are unable to make friends. The events I participate in show this is far from the truth. Chris and Shane inspired this blog. 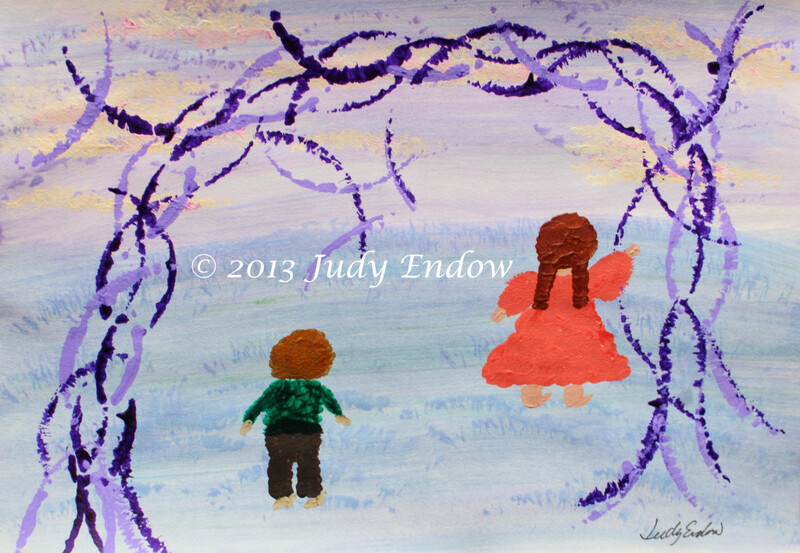 They made me think of the many friendships develop over the years I’ve been facilitating the Art of Autism project. Often people on the spectrum make better friends as they seem to value important things rather than the superficial. Many times friendships develop among different-aged participants. This ends up looking more like a mentorship-friendship. For example, last year in Ventura everyone was impressed when Andrew Mendoza gave Kai Viruleg a painting of a Collie that Kai admired. The gesture was beautiful and genuine. Andrew Mendoza and his mom Rosie received a beautiful painting in the mail a few months ago from Michael Tolleson. Wyatt, Kelly Green’s son also received a painting from Michael. That made me think of how the cycle continues. Generosity of spirit is what friendship is about. 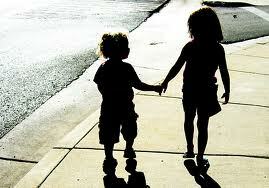 Friendship can develop between nonverbal and verbal people. Last year, I wrote an article for Autism Eye about the artist Eddie Callis from the U.K. Eddie has developed a close relationship with the amazing vocalist Kyle Coleman. Kyle is nonverbal. Eddie encourages Kyle in the arts and thinks one day he can help Kyle to speak. They have a true friendship. I wrote a blog last year about the Autism Movement Therapy workshop, where Dani Bowman reached out to my son Kevin. Dani is a friend to many. In Hollywood at Mr. Musichead, Dylan Aragon sang with Nick Guzman accompanying him. Nick stepped out of the spotlight to allow, Dylan to shine. The owner Sam, told me later, that our event was “life changing” for him. I think he told me this because the average person who doesn’t know many autistic people have preconceived ideas about autism, that may be far from the truth. That is because the media has done a number on us. The Art of Autism hopes to continue our events in the future. We hope to see many more friendships continue to blossom and grow. I’m ending this blog with Kyle Coleman’s “Just Listen” because when we listen we can be better friends. Photographs have the power to inform and sometimes change how we think about something. An example of the transformative potential of photographs is the Farm Security Administration Photography Project which was carried out during the Great Depression. In that project, the FSA commissioned photographers to visually document the daily lives of tenant farmers and sharecroppers to give Americans a front row seat on the devastating affects of a longstanding drought. Many believe the project sufficiently influenced the views of enough Americans to allow passage of the New Deal economic reforms. To provide authentic images of autistic people, so the world can see the many diverse faces of autism, begin to understand its effects, and support the cause. 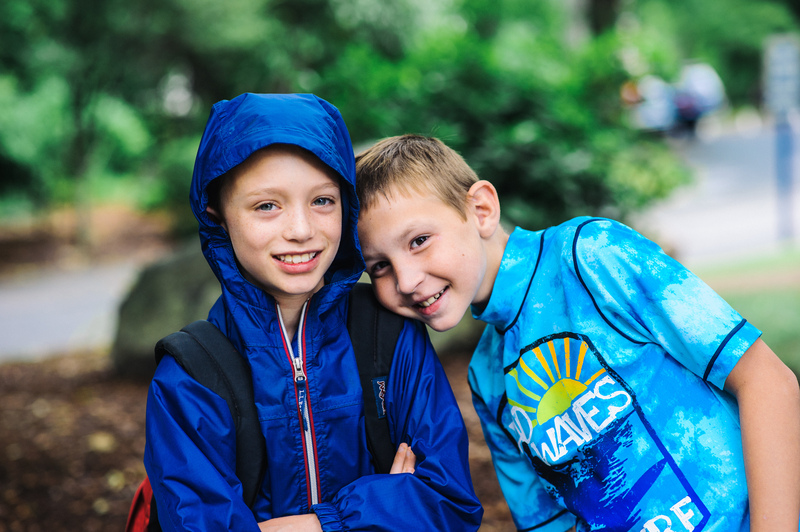 To ensure the authenticity of their images, Kristin often takes photographs of children and families while in the middle of their daily activities, doing what they normally do or in celebratory events, such as a regional benefit walk for Autism Speaks. Chalmers was recently named the official photographer for Autism Speaks New England. Kristin has a son with PDD/NOS and is sensitive to the sensory and situational challenges of children on the Spectrum when she organizes and schedules photo shoots. Photo subjects aren’t generally asked to pose in formal portrait-taking sessions because those sessions involve many elements which are upsetting to children on the Spectrum – dressing in uncomfortable, possibly sense-violating clothes, going to a strange place in an unfamiliar situation and sitting and smiling on cue in a studio with bright, hot lights. For times when formal photo sessions are scheduled, Kristin is willing to change the schedule if the appointed day turns out to be one when the child has a hard time getting regulated. She works, not just to create insightful, poignant pictures, but also to make sure the photography process is a good and beneficial experience for the children she’s working with. When you scroll through the Spectrum Project collection of pictures, you may first simply see that the photos are beautiful and well composed. Then, as you continue to look, you find yourself walking alongside the children and the adults who love and support them. You’re caught up in the spirit and rhythm of their lives. This is a very good thing indeed. It’s a good thing for Spectrum families. Better yet, it’s a good thing for neurotypical individuals who struggle to understand Autism as more than a “light it blue” campaign during Autism Awareness month and news stories about children in crisis. If you are looking for professional photographers who could take a picture of your special moments, make sure you take a look at PMAI Photography NYC. A man is talking to a group of people at work about his recent vacation. A co-worker stands at the outer edge of the conversation group and interrupts the story, saying (a little too loudly) – “Hey, did any of you know that the last drive-in movie theatre in the state has decided to shut down for good?” __________________________________________________________________ The teenager and co-worker in these examples might be easily dismissed as rude or weird or tactless or stupid. Truth is, they’re perfectly normal for individuals with High Functioning Autism (HFA). Individuals with HFA possess many of the technical skills of conversation. They can say words clearly and use grammar correctly in long, complex sentences. However, they don’t inherently understand the rules for social language – such as tact and staying on topic — which allow them to engage in the appropriate back-and-forth conversations which are precursors to making friends and developing relationships. Video Behavior Modeling is an Effective Tool for Teaching Social Skills Individuals with HFA can learn social language skills when those skills are directly taught to them. Research studies conclude that one of the most effective strategies for teaching social language skills is video behavior modeling. In video behavior modeling, target behaviors are broken down into small component skills. For example, engaging in conversation involves the skills of maintaining eye contact with people in the conversation group and paying attention to what others are saying (joint attention). The skills of maintaining eye contact and paying joint attention to others are modeled in separate videos by a peer (peer modeling) or the student (self modeling). The student watches the skill demonstrations and then imitates the behaviors, individually and in conjunction with each other, until the skills seem familiar and easy to repeat. In time, a student may be able to generalize the skill, meaning he/she may be able to move beyond using the skill in the specific practice setting to using it in new, unplanned situations. Generalization may or may not happen for individual students. Even if skills are generalized, the jury is still out on the question of whether ASD individuals ultimately learn to intrinsically understand social behaviors or simply perform them as they would a memorized script. 9th Planet Video Behavior Modeling Program – Adds Humor There are several video modeling programs which can be used to teach social skills. One program, called 9th Planet, uses video modeling along with elements of humor to encourage sometimes reluctant ASD teenagers and young adults to actively engage in social skills lessons. The 9th Planet program uses a “stranger in a strange land” theme to demonstrate social skills in an entertaining way to spark student interest in the characters modeling the target behaviors. The videos feature a young man named Tad Shy who hails from the 9th Planet (hence the program name of 9th Planet). Tad is stuck on earth where social rules are different from the ones he used (or didn’t use) on the 9th Planet. 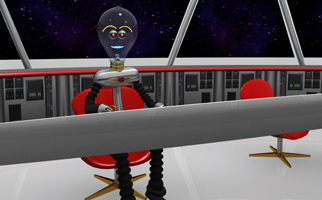 He encounters social situations he doesn’t know how to manage and is coached by a talking, animated computer named Bob. The videos model and the a wide variety of social skills, from relatively simple skills such as eye contact to more complicated skills like recognizing false friends. One teaching series models social skills for students who are searching for jobs. Some of the job search topics include networking, Website design, working with a job search mentor and doing information interviews. Learning By Doing The learning in the program goes beyond video modeling and into learning by doing. Tad Shy, the central character, is played by a young man on the Spectrum who edits the videos and assists with script writing. Many of the videos feature young people on the Spectrum who play different characters in the videos. Learning plans include theatre-influenced activities such as role plays, conversation volleys and improvisation exercises in which students actively practice skills to reinforce the video learning. Students also work on projects to create their own social skills videos. Locally Produced, Globally Sold The 9th Planet videos and learning plans are produced by a family-owned company in Minnesota. Videos are shot at business locations throughout the Twin cities metropolitan area, including local libraries, independently-owned coffee shops, grocery stores, photography studios, candy stores, classic car shops and candy stores. Animation and animation voicing for the spaceship computer are created by one of the company producers. The videos and learning plans are used in a growing number of secondary and post-secondary classrooms throughout the United States. They are also being sold in Australia, the U.K., Germany and Canada. This fall (2013), the company’s co-producer will teach program-based classes about the social skills involved in finding and keeping a job for the Autism Society of Minnesota. Next Steps – Jobs and Tough Stuff Skills 9th Planet is now focusing on teaching the socially complicated skills which generally preoccupy transition-aged and young adult ASD learners. A skill set package about looking for jobs – Job Searching on the Spectrum – was released in Spring 2013. A follow-up skill set package about social skills used on the job is in the early phases of script writing and production. A single e-pub video and learning plan called Recognizing False Friends will soon be released in August 2013. Recognizing False Friends teaches some of the skills involved in discerning when a friend isn’t trustworthy and saying “no” to an untrustworthy friend when personal boundaries are crossed. The production team is also starting work on a series, requested by a local school, about dating and romantic relationships. Bottom line — there’s a seemingly endless list of social language skills to be dissected and taught to teen and young adult ASD learners who struggle with communication and relationships. 9th Planet videos and learning plans use researched effective practices to teach those skills. Most importantly, the 9th Planet program is designed to make social learning a challenge but also fun – because if ASD students think social skill learning is only a matter of hard work, it won’t happen. Aspies on TV – Do They Get a Fair Shake? Robison offers a rough timeline of the Aspie character trend in TV. He pegs the start of the trend to late 2005 with the arrival of Jerry Espenson, a socially challenged attorney in Boston Legal. The next major trend mark came in 2007 with Dr. Sheldon Cooper, a know-it-all theoretical physicist in The Big Bang Theory. And with the recent release of The Bridge, whose central character is brilliant, rules-obsessed Detective Sonya Cross, the trend shows no sign of slowing down. No question, an increasing number of fictional TV shows feature characters with Asperger’s. This trend raises several questions. Such as — What is the genesis of all this interest in Asperger’s on the part of TV producers? How do producers and writers decide whether or not to openly name Asperger’s as a diagnosis for characters in the shows? Then there’s the knottier question which is offered in the Huffington Post article: are individuals with Asperger’s thoughtfully portrayed on TV? Regarding the attention to Asperger’s, it may simply be that, script writers – like everyone else – are increasingly aware of Asperger’s and Aspie traits are fun to write into a drama/sit com character. Aspies are both uniquely gifted and puzzling to “neurotypicals.” It’s a perfect formula for creating a character with dramatic or comic interest. Also, maybe there’s a personal relationship with Asperger’s for some TV writers – a variant on the old adage about writing about what you know. 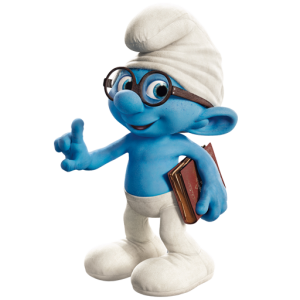 It’s possible that many writers are themselves on the Spectrum and whether or not they’ve come out of the Aspie closet, they’re using elements of their own personalities in their characters. The Huffington Post article notes that the creator of the Community’s Abed Nadir, discovered that he himself is on the Spectrum in the course of his research about the character. On the question of whether or not to make on-screen Aspie disclosure, writers and producers understand that the extent to which Asperger’s is injected into the story mix can change the story’s tone. In Parenthood, which is a comedy-drama, Asperger’s is out in the open and dealt with in a straightforward manner. 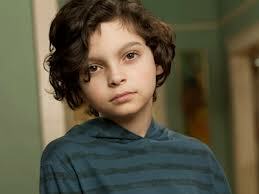 First-time viewers quickly learn that 8-year-old Max Braverman has Asperger’s. Autism is a central part of nearly every episode. In contrast, Big Bang Theory – a straight-up comedy – Sheldon Cooper obviously manifests many Aspie traits, but he is not diagnosed as such on the show. 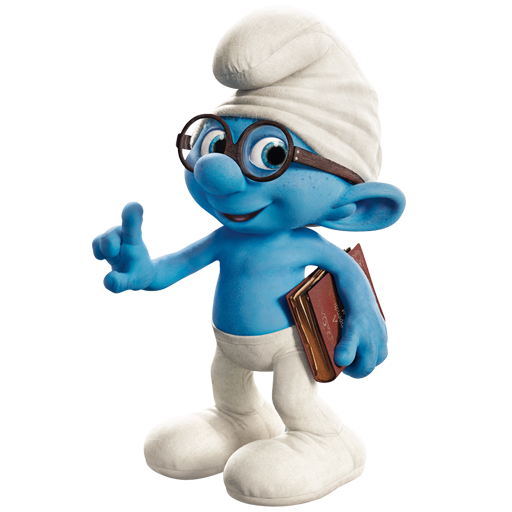 In fact, producers and writers adamantly insist (because they continually get questions on the subject) that Sheldon is Not On The Spectrum. End of story. Then there’s The Bridge, which is a drama. Detective Sonya Cross has Asperger’s but her diagnosis is not named aloud on the show. Some reviewers have been critical of this decision, saying that disclosure of the diagnosis might help clarify some of the Detective’s confusing behaviors. Diane Kruger, the actress who plays Detective Cross explains the decision to not openly disclose the diagnosis, saying that show writers didn’t want Asperger’s to be the character’s defining trait. (Interestingly, Kruger says she also has Asperger’s and the Asperger element is what first drew her to the project). Beyond these basic questions is the larger and more complicated issue of whether individuals with Asperger’s are thoughtfully portrayed on TV. Based on a limited viewing of some of these shows, it seems that TV “Aspergians” are portrayed in a way that makes their social clumsiness a point of interest and often amusement (think Sheldon Cooper), but not ridicule. Viewers tend to like them, social warts and all. Also, the Aspie characters are fairly treated by their friends, peers and relatives. However – again, based on fairly limited viewing – many of these characters are written as people with brilliant minds who make significant contributions to their professional fields. These types of characters are interesting to watch. But their situations don’t reflect the experiences of many on the Spectrum who are “Lake Wobegone” average – those who are simply trying to make their way in a world which despite massive new awareness of the diagnosis, still doesn’t understand the varied nature of their daily challenges. And this may be a central concern with TV portrayals of Asperger’s – that they hook into our tendency to try to understand the unfamiliar through the use of generalizations and labels. They do an end run around the real road to understanding individuals with Asperger’s which involves learning through simple attention to others, through individual conversations and through active listening and acceptance — and not through a series of laugh lines or cliffhanger conflicts. What does a robot look like? We had his name – Bob. His role in the videos is to provide the “teaching voice.” He’s a friend, a confidant, an advisor; a little bit of an external conscience – like Jiminy Cricket in Pinocchio. But what should he look like? 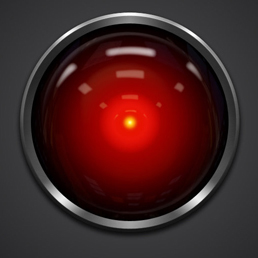 We could have taken the easy route and made Bob a blinking light on a control panel, like the ship’s computer in Star Trek, or HAL 9000 from 2001: A Space Odyssey. But that wouldn’t fit well with the social interaction that we wanted to demonstrate. 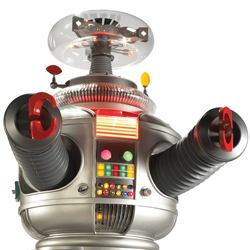 At the same time we wanted to avoid the silly mechanical man look, common among children’s toys and cartoons. 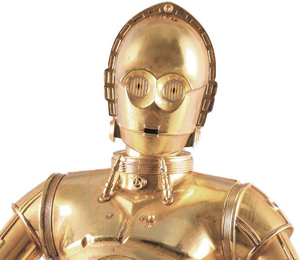 And we didn’t want him to be an annoying busybody like C-3PO from Star Wars. Bob needed to be friendly, approachable. 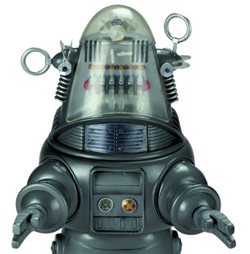 So we first looked for inspiration to the iconic robots from classic science fiction: Robby the Robot from Forbidden Planet, and the Robot from Lost in Space. 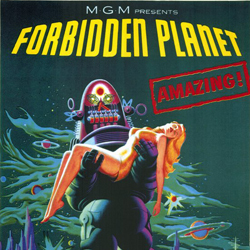 (In spite of the lurid movie poster showing Robby holding aloft a helpless victim, he is in fact a gentle helpful soul.) Then Tristan pointed out the difficulty of demonstrating facial expressions on a robot without a recognizable face. 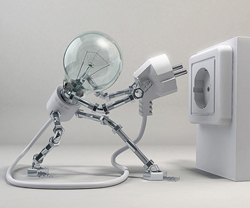 And then inspiration hit, the light suddenly switched on – a light bulb – like the light bulb that appears over a cartoon character’s head when they h ave an idea. 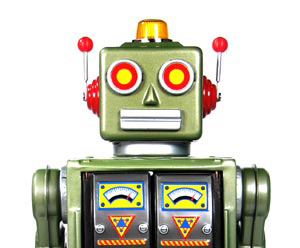 We took bits and pieces from our favorite robots, and reassembled them into Bob. His light bulb head came from Gyro Gearloose’s nameless little helper, and his corrugated hose arms from the Lost in Space robot. His eyes are HAL’s red glowing orbs enclosed in stainless steel lids. 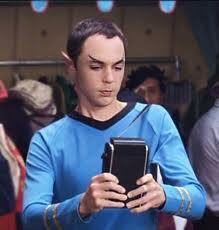 His eyebrows are light bulb filaments. His mouth is the squiggly line from an audio waveform, done in electric blue. For his voice we tried several different mechanical-sounding treatments, but most were either difficult to understand or hard to listen to. Finally we settled on just a bit of reverb to indicate his location on the spaceship. Once we had him ensconced in his seat at the control panel, Bob was ready for his close-up. Is Your Teen Tad Shy? I recently had the pleasure of speaking with Melva Radtke who, along with her husband and son, created 9th Planet. This unique video modeling program helps Tweens, Teens and Young Adults with Aspergers and high functioning Autism navigate the social world around them. Following a science fiction storyline that will appeal to this age group, the videos feature Tad Shy an alien from the 9th Planet. Tad wants to interact with the “typicals” on this planet and Bob, a robot on his spaceship, acts as his coach, guiding him through social situations. The videos come with a workbook and are entertaining and humorous to encourage the repeat viewing that reinforces the social skills they teach. 9th Planet currently offers two skill sets. The first one deals with basic situations such as physical space, asking questions and eye contact. The second one tackles more complicated situations such as empathetic listening, recognizing sarcasm and phone skills. 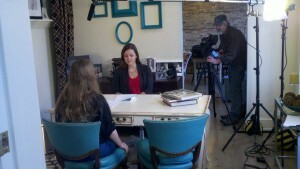 A new series offering job search skills is currently in production. This series will focus on the executive function skills needed for a job search and in the workplace. And the best part, is that several members of the cast and crew have Autism Spectrum diagnoses. As with many innovative special needs programs and services, this one was created by a mom. Melva is an attorney and educator with a son on the Autism Spectrum. Tristan, AKA Tad Shy is now in his 20s but he wasn’t diagnosed until he was in Junior High. When he was younger, they knew something was “off” but no one could quite figure out what. He was diagnosed as ADHD and put on Ritalin but it was clearly not the answer. Then an article appeared in Time Magazine about Autism and Aspergers Syndrome. The Radtkes felt like they were reading about their own son. So while they had a name, Aspergers, and even an IEP, Tristan was aging out of programs designed for younger kids. Nothing in Tristan’s school programs fit him. They had nobody to help. So, out of frustration with their own situation, 9th Planet was born. Melva and her husband had seen other videos and thought, hey, we can do that! So they did. Now Tristan has a diploma in film editing from a technical college and does the video editing for the Tad Shy series. Melva says that being able to create something useful for their son and others is very rewarding. She says it’s been an amazing experience to watch the social impact the videos have had on a worldwide scale. And not only are other parents sharing success stories but the videos are also being used in school classrooms. Tad and Bob give teachers, therapists and parents a point of reference when they talk about a skill that is less personal and less defensive. And ultimately more helpful. I remember going to daycare every morning with my brothers. I remember that daycare well. I remember the pride I felt because I was in kindergarten and would leave my little brothers behind to go across the street to school when the bus came. I also remember Tristan asking every. single. morning where we were going, even though we were always going to daycare. I asked my parents why he did that and they said Tristan just liked to know. I remember Tristan liked to smell everything. I remember Tristan liked to bounce. He has always walked on spring-loaded toes. My grandmothers each admonished him for it and bemoaned the poor future of his feet if he didn’t start walking flat. I remember Tristan hanging on the fringe of Damien’s and my games. As the oldest, I was ringleader and Damien was my second. Tristan was just there. He went along with everything, but his interaction was minimal. 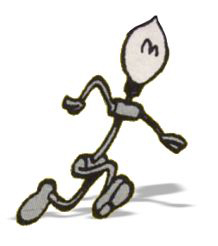 He was a skinny blonde shadow. Tristan was my weird little brother, but I don’t ever remember thinking anything was wrong with him. When Tristan got to school, his world changed. Instead of a twin brother and older sister that he knew well, he had strangers for peers. He had teachers who saw something unidentifiable in him and labeled it as a problem. He had to go to the nurse’s office every day to take his Ritalin. When we began taking the bus home after school instead of going to latchkey, I remember Tristan had to watch Arthur at 4:00pm every afternoon. When I was in sixth grade, a friend introduced to me Pokémon, which was also on at 4:00. I very clearly remember Tristan’s behavior when Damien and I tried switching the channel on him to watch this new show. That was the first time I realized how important routine was to my brother. My parents took Tristan off Ritalin while he was still in elementary school. I had moved on to the larger pastures of junior high. Even in separate schools, though, I heard stories about the weird little kid who danced around the playground and “ate woodchips.” He wasn’t eating them, he was tossing them and catching them, and it was no surprise that juggling was second nature to him. That was the first time I became defensive of my little brother. Tristan was thirteen years old when he was diagnosed with Asperger’s Syndrome. His unidentifiable “problem” that had been misdiagnosed as ADD/ADHD, and that we, his siblings, had seen as quirkiness, was featured on the cover of Time Magazine. My parents read the article. It was as if someone had invisibly been following Tristan without anyone’s knowledge and had then written exclusively about him. A psychologist confirmed my parents’ hunch. Suddenly Tristan was on the autism spectrum. With a diagnosis comes help, right? Not for Tristan. At the time of his diagnosis, Asperger’s Syndrome was relatively unknown. Autism was not yet in the center of the public eye. The resources available for autism spectrum individuals were limited and focused on young children. When Tristan was a young child, he was considered quirky, then hyperactive. No one was trained then to recognize Asperger’s presentation. When his behavior was eventually recognized for what it was, it was essentially too late. He was too old. Tristan has seen counselors, psychologists, and psychiatrists, but as a young adult. He has never been in a formal program for ASD. He was thrown into and has remained in the “mainstream.” He had an IEP for his misdiagnosed ADD, and he went to speech therapy for a lisp. No one taught him how to cope with the instability and volatility of the world. No one taught him how to read facial expressions or interpret the inflections of voice and body language. No one taught him how to navigate a conversation, or even how to control his own voice. Tristan cannot see the things we take for granted to help us navigate an unruly reality. And that’s where 9th Planet™ comes in. Using movie-expert Tristan’s video editing skills, 9th Planet™ videos demonstrate how social skills work in typical situations – in the classroom, at work, or in social settings. They explain the social “rules” that Typicals follow, in a way that teenagers and young adults enjoy and appreciate. And Tristan can help others like him deal with the oft-confusing Typical world.